Athletes get a lot of credit for the dedication, strength, & sacrifice that they show. And they fully deserve that credit! 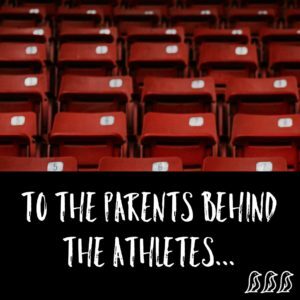 However, they are not the only ones showing dedication, strength, & sacrifice… this article is a “Thank You” to the parents of athletes who are the silent strength behind that success. Thank you for the hours that you spend in the car driving to practices & competitions. Through sports, YOU are providing your children with incredible life-lessons that will serve them well throughout the rest of their lives. Win or lose, they are building character directly because of your support & efforts.